The XBPT Series incorporates a spring cage connection system proven in applications that are sensitive to vibration. The spring mechanism always exerts the same constant force on the wire, resulting in a vibration proof, gas-tight connection, and independent of the user. The space-saving front connection, with the wire and screwdriver coming in parallel from the same direction, allows for simple wiring in places where there is little space available. The connection point is opened with a standard screwdriver. After the wire has been inserted into the wire guide of the terminal block, the screwdriver is removed and the wire automatically makes contact. The space-saving design and front entry design make the XBPT Series ideal for control systems where there is little space. 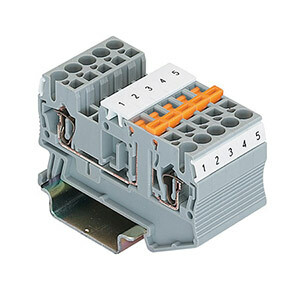 Even so, they offer maximum connection space, resulting in fast wiring of stranded and solid conductors, with or without ferrules. XBPT terminal blocks are available with cross-sections from 2.5 mm2 up to 35 mm2. The double bridge shaft can accommodate individual chain bridging and step-down bridging from other terminal blocks.